The heart is a pump. Albeit a very intricate and complex mechanism, it is still essentially just a pump. And like any mechanical pump, the heart can get clogged and break down if it is not well maintained. So, the heart needs tender attention and maintenance. Empower yourself by understanding the heart anatomy and knowing how your heart works. The average heart beats 72 times per minute. In the course of a day, it beats over 100,000 times. In one year, the heart beats almost 38 million times. By the time you are 70, it would have beaten about 2.5 billion times. The heart is a hollow, cone shaped muscle located between the lungs behind the breastbone. Two thirds of the heart is located to the left of the body’s mid-line and one third is to the right. Each chamber is equipped with a one way valve. This prevents blood from flowing back. When the heart beats, the action is called systole. This action pumps the blood out of the heart. The heart then relaxes, this is called diastole. This action allows the heart to be filled with blood again. The right and left sides of the heart have separate functions. The right side collects oxygen-poor blood from the body via the vena cava and pumps it to the lungs via pulmonary artery, where it picks up oxygen and releases carbon dioxide. 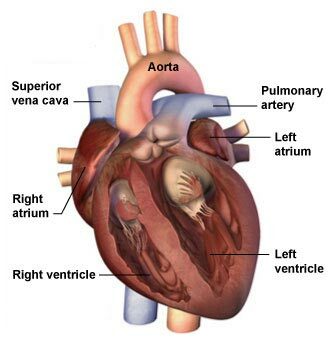 The left side of the heart collects oxygen-rich blood from the lungs via the pulmonary vein and pumps it through the body via the aorta so that the cells in the body have the oxygen they need to function properly. To better understand how the heart works, watch this excellent Heart Anatomy video.